MANCHESTER, Sporting Alert – Zlatan Ibrahimovic scored a brace, Paul Pogba impressed on his return, and Manchester United beat Southampton 2-0 in the English Premier League at Old Trafford on Friday night. Ibrahimovic, who also scored in the 3-1 win for Manchester United at Bournemouth in their opening game last Sunday, opened the scoring for the home side when he headed home powerfully out of the reach of Saints goalkeeper Fraser Forster in the 36th minute. The Sweden forward then doubled his tally and netted the second on the night for Jose Mourinho’s side from the penalty spot in the 52nd minute. Former Southampton defender Luke Shaw was fouled inside the penalty area by a clumsy Jordy Clasie, who made a poor challenge on the United left-back – giving referee Anthony Taylor no other choice but to point to the spot. Regular spot kick takers, Wayne Rooney and Juan Mata made way for Ibrahimovic, and he smartly stepped up to send Forster the wrong way. For Ibrahimovic, who named Man of the Match, it was four goals in three games. “If the team does good the individual does good always,” he told Sky Sports 1. “I tried to do what I’m best at, create chances and help my team-mates and then scoring goals. “So far three goals in total. I’m happy for the team, two games, two wins. We need to get used to winning because the mental part is also important, not only on the physical part. 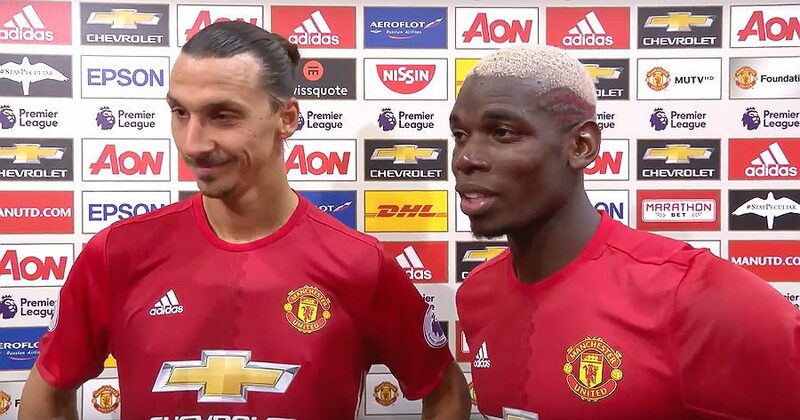 Meanwhile, Pogba also made his second debut for Manchester United and he impressed in his 90 minutes of action. Pogba had more shots, touches and key passes than any other player on the pitch at Old Trafford, while finishing with a passing accuracy of over 80-percent. “It was great. I came back home and I am happy for the win,” Pogba said. “It’s a great feeling, I’m very happy,” he added. “I was relaxed, no nerves, I played my game. I came here to win, that is what I always wanted. It’s a top club and we need to get used to winning and carry on like this. Mourinho added about the Frenchman: “He was fantastic. “The fact his first action was bad – he loses the ball, gives a counter to the opponent – means you could see even more the ego, the personality…he’s so comfortable under that skin of a star. Southampton had the better of the possession, total passes and passing accuracy, but failed to breakthrough the United defence, which was once again guarded by Daley Blind and Eric Bailly. With the win, Manchester United goes top of the English Premier League table standings with six points from its opening two games of the EPL season.